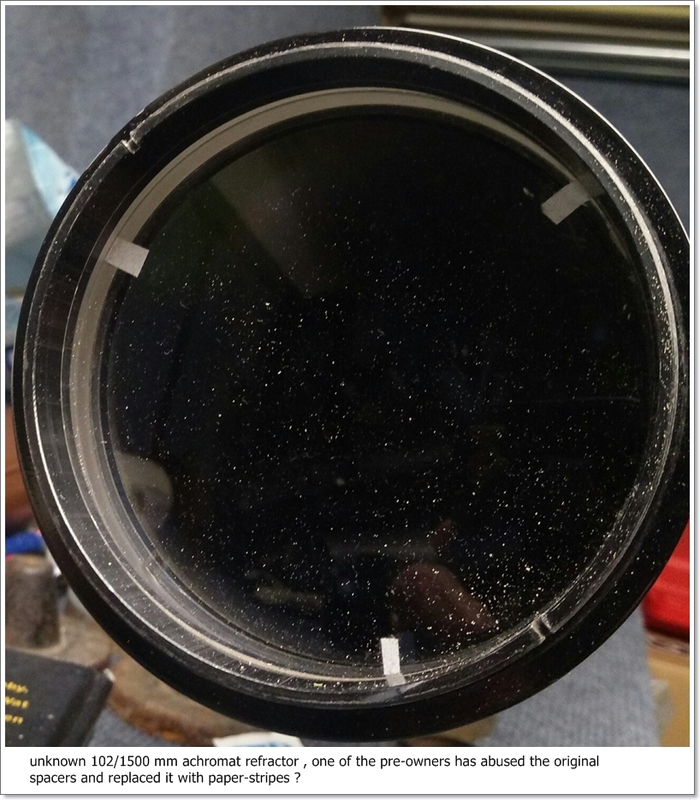 unknown 102/1500 refractor - origin or ATM ? What is it ? maybe you can help me to identify this strange refractor ? I will get this scope in february...till now, i just have a few pics. The guy who will give me this refractor has do not know any thing about this scope. Well I'm a classic scope friend, as we all here.....but this thing is a mistery for me. Well I'm really not a greenhorn in classics scopes and have own many classic scopes and collect them, but I have never seen a refractor like this. Of course its no Unitron, but its no SYW Yamamoto, no Vixen ( but some little details look like Vixen or Celestron ), no other well known japanese producer AFAIK....so what is this ?? Could it be an early Antares Elite ???? The strange is really the cell...nearly all well known 102/1500 achromats have/had a cell wit 3 pairs of push&pull screws...but this guy does not ! I remember the Celestron C100E, little details like the focuser and the rings remember me at this, but overall its certainly NOT a Celestron, I guess. Is it a origin product OR is it maybe a complete ATM refractor ??? Edited by AaronM, 19 January 2018 - 01:05 PM. Could it possibly be a Mizar? 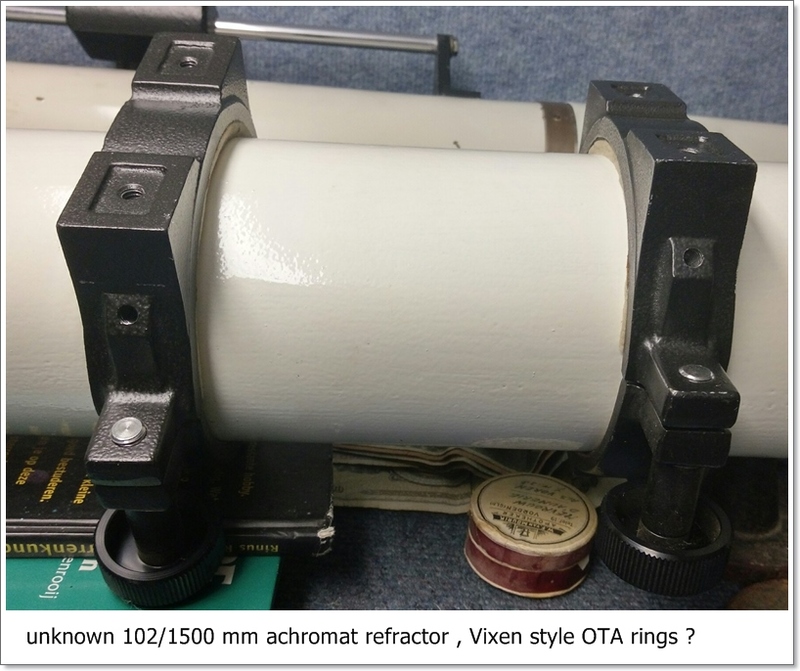 I would not rule out an ATM project, but some of the parts definitely come from Japanese telescope manufacturers, as they are consistent with the style then in vogue there from the early 1980'ies to around 2000. I've tried looking through some old catalogues online, but haven't found a clear match for the parts yet. The focuser definitely makes me think Vixen. 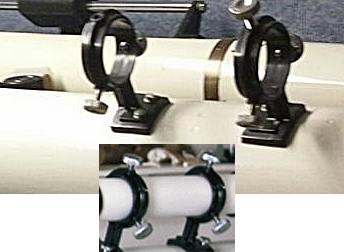 The tube rings COULD be early Vixen, made for the Saturn mount. They're definitely different from the rings later used on the Polaris, SP and GP series. Sadly, the Vixen catalogue scans on Galakuma's site are too low resolution to allow me to see the details clearly. A closeup of the focuser would be nice. I've found no matching parts in Mizar, Kenko or Carton catalogues. Neither Mizar, nor Kenko made 4" refractors and the Carton was an f/13, not f/15, and the details don't match. Edited by Astrojensen, 20 January 2018 - 07:13 AM. Thanks so far, friends...well seems I have to wait till february to inspect it in detail......worst thing is the lens. One of the pre-owners has lost the original spacers and replaced them with paper-stripes (?). Well, before I will spend many hours in restoration, I'll let check the optic by Wolfgang Grzybowski. He's a well known optic specialist in germany and saved many optics and has great experienes in measuring and optimizing of mirrors and lenses. .....could that be a Jaegers cell ??? Edited by AaronM, 20 January 2018 - 08:02 AM. jaegers or edmunds cell. I have both and they do look similar. The spacers almost look like something Surplus Shed would have done when they were selling Jaegers objectives. It looks nothing like the cell on my 4” F15 Edmund refractor. Paper strips might actually not be such a bad idea for spacers on an achromatic doublet, since their thickness is very uniform, when under pressure. I've used black electrician's tape, as well as common household tape, with great success in the past. Have come across doublets with postage stamp edge trimmings. Worked just fine. Thank you friends for your hints ! Dear Kokatha man : I guess your hint to Daiiti may be a hot scent ! Does not look at all like my 4" Jaegers cell. Mine has a depressed section around it for the label/decal. Edited by AaronM, 26 January 2018 - 07:35 AM. China optics and mechanics are constantly improving. I'm sure that will be a fine scope. I had a Meade AR5 with very good spherical correction - just recently sold it and the new owner is ecstatic. Its main optical defect was lack of the superb polish one sees on the old hand-worked Japanese lenses. i have now a suspicion ! A few years ago I had a 76/1250 mm refractor Prinz Model 660 made bei Kenko - and : yes, the lens cell looks very similar !!!! Is my 102/1500 maybe a Kenko refractor ??? Is my 102/1500 maybe a Kenko refractor ? The biggest refractor I can find in the Kenko catalogues is a 80/1200mm. it another item, but it belongs a little bit to a classic scope: I had the short chance to test the new Bresser 102/1350 mm Achromat. ...a very depressing read Michael - my sympathies! You state several times that you "think" the lenses themselves might be ok...& besides your "plastic, plastic & more plastic" comments & any possible influence this might have had on the ability of the objective assembly to stay collimated - as the vendor claimed it to be after he worked on it before sending it to you - you also appear to "think" you might have got a dud & Jurie bought a good one - you are a very fair man my friend...I'd be inclined to be much more cynical, personally..! We all make mistakes however & I cannot blame plastic as an issue for the large amount of money I paid for an OOUK 16" "special optics" Newtonian I purchased quite a few years ago now...that really was an absolutely crying shame! Sounds like severe SA caused by a lens mounted backward. Even the cheapest Chinese machine-generated achromat should have reasonable spherical correction and what you describe is not reasonable. Let me describe an experience with a similar scope - a Meade 90mm alt-az refractor I bought for next to nothing, expecting little. Same type cell as this one, but metal tube and dewshield - cheap plastic focuser etc. At the time I had nothing smaller than a 5" refractor and wanted something I could schlep out every night to follow the ring-plane crossing of Saturn back in 2009. f/10. Well this scope performed magnificently. It did its job on the ring-plane crossing far better than I could have hoped. 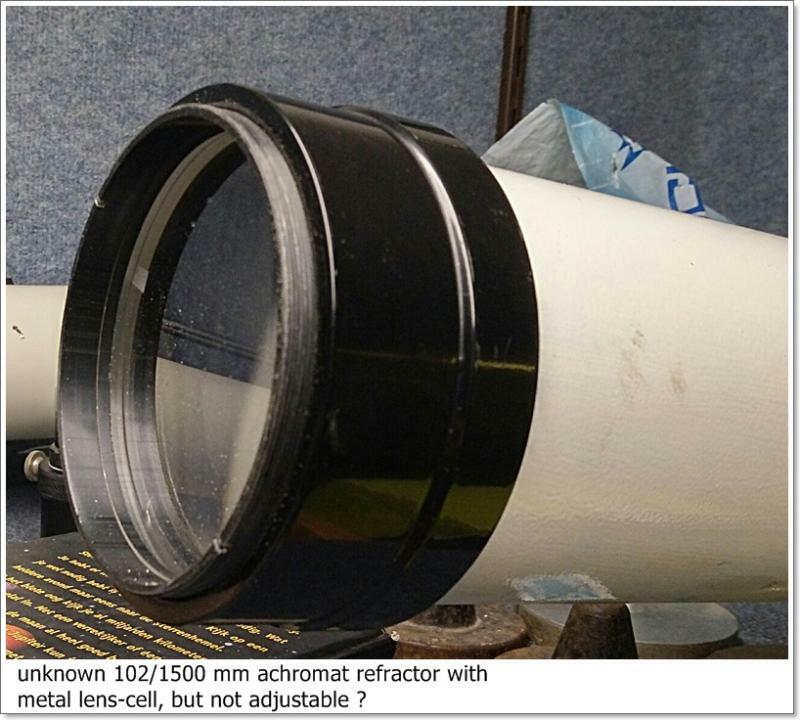 So well that I upgraded the focuser, invented a means of collimating the cell, took care to reduce tube reflections etc. with flocking, and increased the overall performance. The spherical correction is outstanding. There is a slight evidence of a central zone but is very slight. 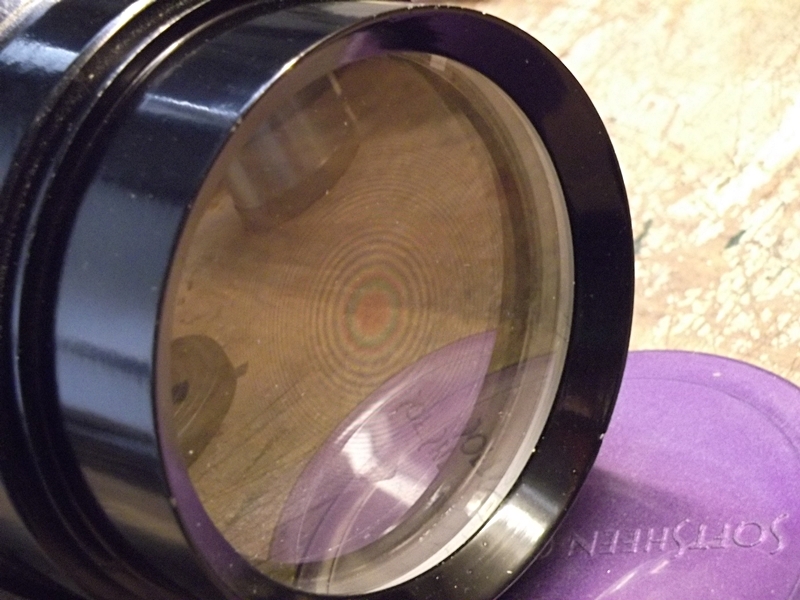 This scope can split Pi Aquilae easily which is near its theoretical limit. The polish is not great, not unexpected from a machine-generated optic. But overall it performs extremely well, and now gets used for low-power cruising with 2" eyepieces. So I would expect a similar report from yours, which is almost surely made by the same house as mine. For the ringless mush you describe, the only possible cause is severe spherical aberration, and that must surely be coming from an improperly assembled objective, where either the entire thing is backward, or the front element is flipped. Edited by deSitter, 01 February 2018 - 08:22 AM. I have already read your depressing report. I've been a member of astrotreff for quite some time, though I don't post much there, but I read quite a lot. For the ringless mush you describe, the only possible cause is severe spherical aberration, and that must surely be coming from an improperly assembled objective, where either the entire thing is backward, or the front element is flipped. I was thinking the exact same thing, the very moment I read the review on astrotreff.de. Personally, I wouldn't hesitate to take the objective apart, inspect it and either mount it backwards or flip the front element. I've corrected Zeiss objectives, where the lens elements had been flipped, so it's EXTREMELY likely, that the same thing could have happened here.